The Bitcoin and Blockchain buzz is continuing! But have you noticed a new term “Smart Contracts” has joined the buzz mania? Why is everyone talking about smart contracts now? What is so “smart” about smart contracts? Well to understand this, we need to see who brought this concept of smart contracts to the table. The name “smart contracts” was coined by a cryptologist computer scientist, Nick Szabo, in the 90s. A smart contract is a computerized transaction protocol that executes the terms of a contract. The general objectives are to satisfy common contractual conditions. To make it easier to understand, let’s fast forward to the 21st century. Consider a real-life example where you are taking out a bag of potato chips mapped against the trigger number “B6” of a vending machine. You put a $10 note in a vending machine. This action triggers the next option for you to select a number (like B6) on the vending machine. And what happens when you select B6? A lever in the vending machine moves and pushes out the bag of chips. A smart contract self-executes the “if-this-then-that” conditions coded onto it in the same way that triggers are implemented in a vending machine. But why is everyone buzzing about the outdated technology in vending machines? 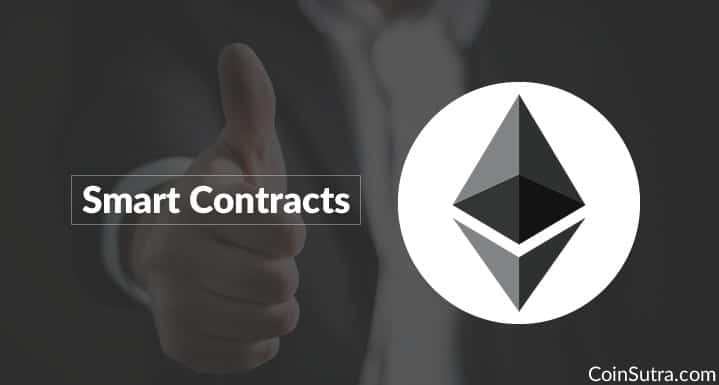 The buzz is about the smarter contracts that are based on Ethereum technology. The Ethereum blockchain mechanism coupled with smart contract technology removes intermediaries and escrow services. Let’s dwell deeper into the concept of smart contracts so that even a non-techie can understand. Ethereum – A blockchain which records all executed codes as transactions. Ether – The cryptocurrency which fuels the Ethereum blockchain. To be even more familiar with Ethereum 101, see our guide on “Ethereum Cryptocurrency: Everything A Beginner Needs To Know”. And when this smart contract’s centralized code is made decentralized for execution purposes on the Ethereum blockchain, it becomes a smarter contract. Coding and executing smart contracts on the Ethereum blockchain makes them immutable and independent from centralization. How Do Smart Contracts Work on Ethereum? Developers write the code of smart contract using the native language of Ethereum called Solidity. Once the code is written, it is uploaded on the EVM- Ethereum Virtual Machine, which you can say is a universal runtime compiler or browser to execute the smart contract’s code. Now once the code is on the EVM, it will be same across each Ethereum node. A contract of Ethereum will involve two or more parties which will be fueled by the digital asset (Ether). Once the contract is executed successfully, the digital asset will be distributed or re-distributed according to the logic defined in the code. Assume that Harry has given a contract of $1000 to Mary for web development. Harry has hardcoded the requirements and conditions about the kind of website he needs onto the Ethereum blockchain. Now, Mary submits the work on the blockchain for evaluation. If the conditions set by Harry are successfully evaluated, and the website is done as per his coding requirements, then the contract worth $1000 will be instantly self-executed, and payment in equivalent Ether (ETH) will be released to Mary. Why Trust an Ethereum Smart Contract? Moreover, Harry can’t stop or manipulate this contract as the execution of this contract is no longer dependent on one single party or node. As Harry’s contract is running on an EVM of the Ethereum blockchain, it is resistant to damage caused by a single point of failure. That’s why you can trust an Ethereum smart contract. Supply Chain Mangement (Skuchain) – A material’s supply and procurement are typically tracked with paper trails which are mutable. 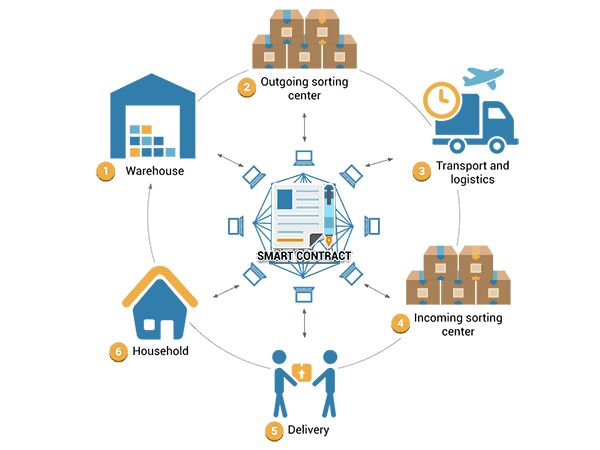 Hence, implementing the supply chain management on blockchain removes the possibility of theft or fraud. Intellectual Property Rights – Musicians, writers, and artists can put their creativity on the blockchain and can control ownership of their work. Smart contracts like this enable the creator to collect royalties and payments directly without any third parties involved. But Ethereum and smart contracts are the next-gen applications on the blockchain. Just like the invention of the internet has transformed human life, the Ethereum blockchain and smart contracts have the power to change human life in incredible ways. Because the marathon has just started; Ethereum is only 3 years old, and many scholars are pursuing a lot of research on it. The floodgates of unparalleled innovation have been opened with the establishment of The Enterprise Ethereum Alliance. The Enterprise Ethereum Alliance connects Fortune 500 enterprises (like Accenture, Microsoft, Intel, JP Morgan, Wipro, etc. ), startups, and academics with Ethereum subject matter experts. With this meeting of minds, it’s highly likely that Ethereum will be the next big cryptocurrency. What do you think about Ethereum and smart contracts? Have you used a smart contract before? Share your experience in the comments below! 1 What is a Smart Contract? 1.1 How Do Smart Contracts Work on Ethereum? 2 Why Trust an Ethereum Smart Contract? 2.2 What is the Future of Smart Contracts? How would a musician currently use a smart contract to enforce copyright? Is there any sort of protocol for this use case currently? Would the music have to be purchased with Ether? Currently, in Music distribution process a long queue of publishers, agencies, streaming services, etc., all of these takes their cut of profit when we subscribe or buy the music of an artist. And at the end of the queue is the actual creator-artist who receives the remaining small cut at the end that too after 6-12 months. Using smart contracts consumer and artist will establish a direct relationship. It will ensure the artist gets paid as soon as the consumer has paid for the art without any delay or intermediaries. One such B-a-a-S, Blockchain as a service platform is ready to be launched in 2017. Its name is Ujo Music -based on Ethereum Blockchain. And certainly, the artist would receive its cut in Ether (ETH). Check Ujo’s Co founder’s view on it here. This will cover some techical basis. Yeah deliberately kept this non-technical. Will go through the link you gave for inspiration. There’s nothing Smart in Ethereum Smart Contracts. There’s 2 things that people need to realize, you don’t need Ethereum to come out with a Smart Contract and there’s dozens of other platforms far superior than Ethereum. Ethereum is basically an expensive, congested mess that has massive scaling issues. Thank goodness EOS is coming out soon, the platform that redefines a true scalable platform that goes beyond Smart Contracts. In the case of a Private blockchain if it managed by an enterprise then how the basic idea of decentralization incorporated into it? How can we incorporate the token system in the private blockchain? There is no decentralization in that model. You can still put-in token system and decide miners/delegates who will have the power to control the token. Further, it depends upon if it is a pow or pos system. In my opinion, they just need blockchain for more control. Just imagine government having blockchain and INR as a token, it will be long-term disastrous for citizens.